Thinspiration: The Work Out Begins | Viva La Vida! 2013 barely just begun and I’m back into work-out mode to keep myself fit. 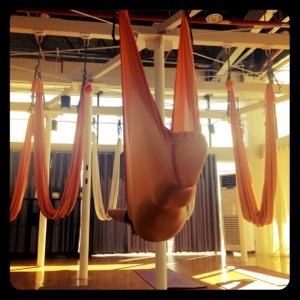 Began my day subbing for Maitri, one of our regular teachers, for her Anti-gravity Yoga class at 9am. It was a last minute call and I was the only available sub that was contacted. It was great to get back into teaching mode and I only had one student so it wasn’t as stressful even if the situation was. And I followed it up with back to back mat yoga beginning with Power Yoga with Anna Man and later on Vinyasa 1 with Rachel. Despite doing 20+13 suryas and then some, it was just great to work out my body and get rid of all those accumulated weight from the holidays. I plan to stick to a similar routine this year focusing on mat yoga and teaching Anti-Gravity Yoga. My fitness goal is to do a headstand an handstand (without assistance) within the year. This entry was posted in Sports Report, The Story So Far, Thinspiration and tagged anti-gravity yoga, fitness, sports, thinspiration, yoga by Roxanne Calingo. Bookmark the permalink.